After Lehi read the book he had been given by Jehovah, he saw of their impending destruction. He warned them with a double "wo" of what he foresaw (1 Nephi 1:13). But then Nephi explains the following, which occurred to his father, Lehi. And it came to pass that when my father had read and seen many great and marvelous things, he did exclaim many things unto the Lord; such as: Great and marvelous are thy works, O Lord God Almighty! Thy throne is high in the heavens, and thy apower, and goodness, and mercy are over all the inhabitants of the earth; and, because thou art merciful, thou wilt not suffer those who bcome unto thee that they shall perish! After Lehi both read and saw many great and marvelous things... tells me that perhaps there weren't all bad things that Lehi saw, concerning Jerusalem. Perhaps he saw the wonderous things which they might be experiencing in the future. Perhaps he saw the holocaust, but saw of the redemption yet to come. It is promised that these are His covenant people, and they will be redeemed. The entirety of what Lehi saw is veiled from our view, but it is not to Lehi. And what he saw was not just horrible destruction, but also "great and marvelous things". We too, can ask to see such things, and God willing, some of us may be able. He did exclaim many things unto the Lord. Many things, not just a few. All of them are words of praise. Despite seeing all the destruction, it is clear that the great and marvelous things outweighed the abominations, destruction, and probably even persecution of this covenant people. Lehi's not mourning their destruction, as we might if we were to view our homeland being destroyed in vision. Great and marvelous are they works, O Lord God Almighty! This is a far cry from the atheism we witness so prevalently in our day. Interesting how when things go bad, even atheists believe. I wonder if anyone heeded Lehi's and the other prophet's warnings. Either way, they praised God for the marvelous works. Thy throne is high in the heavens, and thy power, and goodness, and mercy are over all the inhabitants of the earth. What does high in the heavens mean, besides the obvious altitude? Typically something high, for example the sun, is able to have influence over thousands and thousands of miles below. 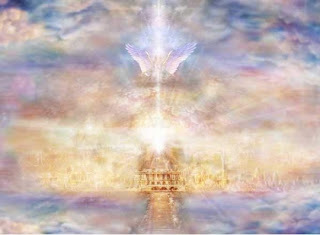 God's throne is high in the heavens, such that His light is able to shine over all His creations. Lehi is praising, in a natural and not forced way, the power, the goodness, and mercy of God for all His creations. This is a far cry from the mean, heartless, and un-merciful being that so many religions create to instill fear in their subjects. Because thou are merciful, thou wilt not suffer those who come unto thee that they shall perish! What does that mean? Does that mean all who follow God will never die? Never know pain? Or the depths of hell? Did the Savior experience death? Did he know pain? Or experience the depths of "hell"? I think he experienced it all, moreso than any of us ever will. He experienced our pains, our sins, and more. Didn't the Savior turn to his Father? Does that make Lehi a liar, or is he getting at something else here? Following God doesn't mean we will never die, or experience hardship. Quite the contrary for some. If we are true followers of the Savior, it only makes sense that our lot should somewhat mimic his. He apostles were all killed, and so many of his true followers are so often persecuted. But that does not mean they will not be saved. God is merciful, and I think Lehi is talking about an eternal perspective here. He (God) will not suffer that those who come unto Him will perish, as in eternal perishing, or eternal damnation. There is hope! We do not have to suffer eternal pains of hell. All can be redeemed if we come to Him. Although for some, that might seem hard, but the first thing to do is to try. Ask for help, and He will help you turn to Him fully, if you're willing. I hope my kids know how much I know this is true.